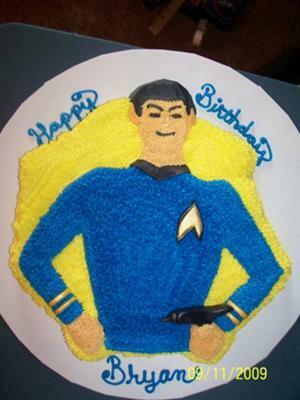 To make this Spock cake, I used one cake mix and the superhero pan. After baking, let cool completely. I used buttercream in ivory for the body parts, black for the hair and facial features, yellow for the background and blue for the shirt. I used round and star tips. I also used fondant for the collar, ears, stripes on the sleeves, the phaser and the symbol on the shirt. I also used the gold glitter stuff on the symbol and stripes. I'm still learning fondant so it's not perfect. I'll keep practicing. Bryan called and said he loved it. And he would've chosen Spock had he known I was doing something Star Trek. He's a sweetie and easy to please. Hi Kelly, for a learner, i think your cake is OK. Even i can't make as good as yours. Keep practising and neve give up !